Classifier or unit count (คำลักษณนาม) is essential when you count something in Thai language, so if you would like to speak like a Thai knowing how to use unit count is a must. Please don’t feel frightened that there are too many unit counts to remember. I think in everyday like we use about 5-10 unit counts. 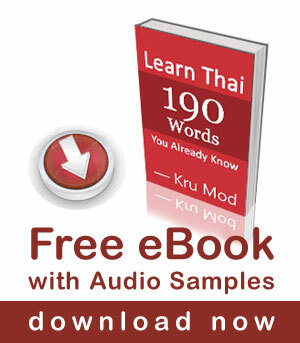 Here is the list of the common Thai classifiers. dtua ตัว animals, clothes, tables, chairs, letters of alphabet, cigarettes etc. an อัน pieces of candy, ashtrays, round object, objects with unknown classifiers. lûuk ลูก fruit, mountains, balls and other round things. krûeang เครื่อง radios, T.V.s, refrigerators, computers, electrical or mechanical machines. jaan จาน numbers of plates, rice, food etc. gâeo แก้ว numbers of glasses of beer, water etc. tûai ถ้วย numbers of cups of tea, coffee, soup etc. VIDEO: How much Per Hour? How would you ask for 2 bowls of quail fried quail eggs? And how do you ask for both hard boiled and quail eggs. And what about those sticky rice doughnuts. Do those count as “round things”? What is the classifier for triangle shaped things, like those sticky rice kanom or those delicious fried yellow bean things? Quail eggs in Thai is ไข่นกกระทา /kài nók grà-taa/, ‘fried’ is ทอด /tâwd/ so ‘fried quail eggs’ in Thai is ไข่นกกระทาทอด /kài nók grà-taa tâwd/. ‘Boiled’ in Thai is ต้ม /dtôm/ so ‘boiled quail eggs’ in Thai is ไข่นกกระทาต้ม /kài nók grà-taa dtôm/. You can place order by saying ‘I would like to have one tray of fried quail eggs and one tray of boiled quail eggs’ –> เอาไข่นกกระทาทอด 1 ถาด ao kài nók grà-taa tâwd 1 tàad แล้วก็ láew-gâw (and) ไข่นกกระทาต้ม 1 ถาด kài nók grà-taa dtôm 1 tàad. what is the classifier of chopsticks? What is the meaning of the word “duay” in Yindee duay” or “Gep ngeern duay krap”? It is a particle used with telling someone to do something , ‘gep dtang’ is a phrase used when asking for a bill, it is literally translated as ‘collect the money’, so you tell the waiter to collect your money then the particle ‘duai’ is used to make it polite. Example; your friend is going to a market and you want to join, so you can say “bpai duâi” (go too). Thank you very much Mod. I will go to เชียงใหม่ next month, I hope I can speak some “pa sa Thai”. I have noticed that in your videos when you say ‘I’, you use your name instead of ‘chun’. Eg: Mod ja bpai gin kaao. Instead of ‘chun ja bpai gin kaao’. Do I use my name when saying ‘I’ or do I use ‘chun’. I’m slightly confused!! I really like your website and your videos ! Classifiers are use to count. But it’s also use to show something right ? Do I have to use classifiers ? Or can i just say : นี่อะไร ? If i’m in the street and I want to ask “what is this ?” (showing food) Do I have to use a classifiers or not ? And if yes, which one ? Sawatdee ka Jeff, apologies for my late response. You can also use นี่ which means ‘this’ without a noun and classifier, so อันนี้อะไร and นี่อะไร is the same. Love these videos, i’m teaching English in thailand and trying to learn some Thai while I am here. When to use tee and when to use jaan/tuai/chaam? a general classifier laang for big things? ที่ /tîi/ is used as a classifier in formal situation for ‘serving’. It is usually used by the waiters in restaurants. If you go to eat on the street, they will just use the container i.e. jaan/tuai/chaam as it is doesn’t need to be formal. I enjoy your videos especially the ones with role play-it really helps to hear the words used in sentences. I see some people here have trouble remembering the 10 classifiers,from my other thai studies i believe you can merely repeat the noun instead of using the classifier for example, pom mee bahn bahn sorng instead of pom mee bahn sorng lang. Yes, the word “lem” is also classifier for knives and candles. “kan” is classifier for cars, spoons and forks. I am sorry I don’t know the reason why one word is a classifier for different things. ao som ???? moo ??? ??? i always saw you are thai language video i get more knowledge and idea, but only 5 minute then after i forget all the words. i think one day i also forget my name. I learn the question word ใด้ ไหม, now you wrote ใด้ มั้ย, I do not see and do not know this before. Do I learn wrong? “ไหม” is a formal written language. When Thai people say this question word, it is pronounced with high tone so there is a new way to write this word to match the new pronunciation. i am always be the practice thai language and also saw the tv but i can’t the remember the any words, so you have to any suggestion for me how is to improve the thai language? You are such a great Thai teacher on website, I love to learn it very much and I hope some days soon in the near future I will speak and understand Thai language very well. kop kun krap! But I don’t know what is different between ‘thang-mot’ and ‘kho-la’. Can you explain about this? I think I was misinformed. Thank you Mod , I like to learn with you!! You are so beautiful !!! Its a true pleasure!! I hope i can speak thai for meet more people awesome like you !! Thanks Kru Mod. You are the best! What is the classifier for websites? เล่ม? The classifier for website is the word ‘website’เว็บไซต์ or in short เว็บ /web/. When the noun and the classifier are identical, the noun can be dropped. Example; I have three websites: ผมมี(เว็บไซต์) 3 เว็บไซต์ you can just say ผมมี 3 เว็บไซต์. the list above shows that ตัว is the classifier for cigarettes บุหรี่ . Would ตัว also be used for packs of cigarettes (ซอง ?) ? thank you Mod for this new video. Hi mod, nice to meet you. Indi didai lujak kun ^^. If I want to one more boild rice in the restaurant, how can I order it? I would like know how to pronunciation these word. I have difficult thai tone……..
Can you help me a video? It is good to know that we only need to learn 5 – 10 of these. It is คำลักษณนาม (คำ ลัก สะ หนะ นาม kam lák-sà-nà-naam).